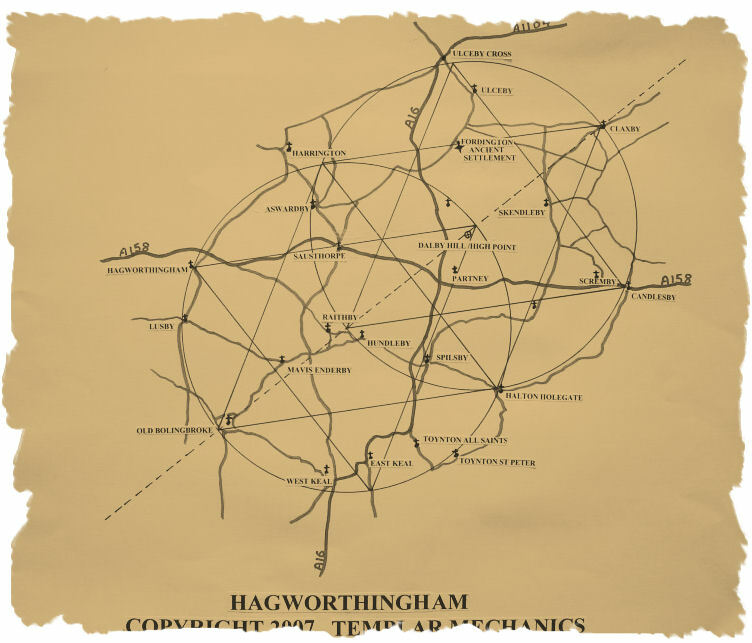 What I have named the Hagworthingham complex is actually spread over two equally merged circles creating a regular vesica piscis …..each circle passing through the centre of the other. Both circles contain a six pointed seal the same as the layout of Temple Bruer village ,but on a larger scale….these two larger circles are also entwined. 1. The EAST circle . Ulceby cross, major landscape feature and road junction. Around Ulceby to the South are major earthworks and tumuli also nearby the… ancient settlement of Fordington. Aswardby church falls on the circle circumference. Scremby church falls near the Candlesby church and seal point , the ancient village of Fordington lies on the seal line between Claxby and Harrington. Ulceby church lies on the seal line between Ulceby cross and Candlesby. Dalby hill marks the high point and is also the centre of the whole EAST circle complex. It is also on the main axis running through both systems…entering at Claxby church on through Dalby Hill ,Old Bolingbroke church and then the seal point, near Old Bolingbroke castle. Ashby by Partney church lies at the cross over of two seal lines …Candlesby – Raithby…. and ……..Claxby – Holton Holegate. Dalby hill high point…which also has ancient earthworks,graves and barrows nearby. East keal church , lies slightly north of the point, but the point is acknowledging the sudden drop off of the wolds onto the flat fens. On the circles circumference we also have Dalby church, Lusby church, Hagworthingham church, Halton Holegate church. Hagworthingham has a mill mound, and the country lane between Lusby and Hagworthingham takes an interesting curve near here to run with the geometry line up to Hagworthingham church. Most of the roads on this WEST circle show an interesting interaction with the geometry, especially from Harrington running south along the West circles edge, it looks to follow /flow with the circles circumference quite obviously around to Hagworthingham then onto Lusby,Old Bolingbroke…..where it then seems to head inwards slightly. Main Roads- A158 / A16M - Both main roads follow a similar pattern when entering the areas geometry. A158- enters near Hagworthingham seal point…...runs with the seal line, then drops down a level as it enters the central area marked by the Rhombus depicting the vesica centre…here it crosses the A16 continues onto Scremby before departing the geometry at the other seal point at Candlesby. A16 –Enters at Ulceby cross seal point…follows the line of the seal, running parallel,…cuts in to cross a shoulder junction of the seal lines…heads towards Dalby hill, dropping down a level and onto the rhombus at the vesica centre to cross the A158 at Partney…It then again follows the seal line south, turning in again to make its exit near the south seal point of the WEST circle. The above is based on a circle diameter of 5.15 miles…10,000 megalitic yards, and drawn on the OS 1:25000 map. .